Arivaca Lake Estates Subdivision is Southwest of Green Valley. 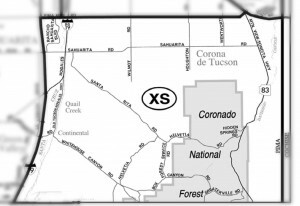 The Extended Extended South area includes Sahuarita, Benson, Vail and Green Valley. Homes in the Extended South area include smaller, older homes, new construction, and large estates. Horse properties are available in this area. Green Valley and nearby Quail Creek are both 55+ adult communities. The Green Valley Hospital was opened in 2015 and services the area. Sahuarita is a growing community with retail, restaurants, and activities. And the shops and restaurants in Tubac are 5 to 10 minutes away from Sahuarita and Green Valley. The Arivaca Lake Estates is in the Extended South Area of Tucson, AZ. Shopping, restaurants, and activities may be a bit of a drive depending on the specific subdivision you live in. A couple of restaurants to visit if you live in the Arivaca Lake Estates Subdivision or another Central area location are Trattoria Ragazzi and The Grill At Quail Creek. Families living in Arivaca Lake Estates Subdivision are served by the Sahuarita School District. Are you thinking of buying a home in the Arivaca Lake Estates Subdivision or another area of Tucson? Finding the right home can be a challenging process. But we can make the process much less stressful for you.